The BOTOX Cosmetic is a highly purified muscle toxin, isolated from a certain strain of bacteria. The toxin blocks the chemical signal between the muscle and the nerve, leading to temporary paralysis of the muscle. The paralysis occurs over 1 to 5 days and peaks in two to four weeks. Results last from three to six months. The effect gradually wears off, allowing the dynamic wrinkle to return. BOTOX Cosmetic diminishes or eliminates so-called dynamic wrinkles in the face. BOTOX Cosmetic acts by paralyzing the muscles that cause dynamic wrinkles. BOTOX Cosmetic is injected into the muscle and prevents the muscle from contracting by blocking the transmission of nerve impulses to the muscle. Because the muscle cannot contract, the wrinkle relaxes. BOTOX Cosmetic is mainly used to treat dynamic wrinkles in the upper third of the face. 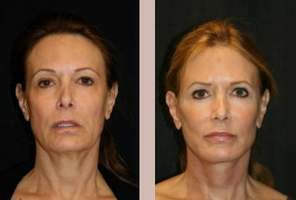 However, many physicians use it to cosmetically treat other areas of the face and neck. Moreover, BOTOX Cosmetic has also been used to treat migraine headaches and even excessive underarm sweating. BOTOX Cosmetic is not as effective on so-called static wrinkles. Static wrinkles are better treated surgically or with dermal fillers. What do BOTOX Cosmetic injections feel like? BOTOX® Cosmetic is injected directly into the muscle that underlies the dynamic wrinkle. A very small needle is used to minimize discomfort. The injection feels like a small prick with a little stinging. The entire procedure takes about 10 minutes. In some cases, ice or topical anesthesia is used to reduce the pain of injection. What will my skin feel like after the botox injections? Usually, there is no pain, once the injection is over. Occasionally, people have headaches after the injection as well as some redness or swelling of the area injected. Usually, one treatment is all that is needed, and the effect lasts for 3-6 months. How long before I can return to my usual activities? Since the procedure is non-surgical, no recovery time is needed; patients can return to work or other activities immediately. The effects usually last 3-6 months. What are the risks of BOTOX Cosmetic injections? The most common side effects are headache, respiratory infection, flu-like syndrome, temporary eyelid droop, and nausea. Less frequently occurring (<3%) adverse reactions include pain in the face, injection site redness, and muscle weakness. These events are thought to be associated with the injection and occurred within the first week. BOTOX® Cosmetic can’t be used if there is an infection at the proposed injection site(s) or in individuals with known hypersensitivity (allergy) to any ingredient in the formulation (i.e. the milk protein Casein). Patients with neuromuscular disorders like Myasthenia Gravis and Eaton Lambert Syndrome may be at increased risk of clinically significant systemic effects from typical doses of BOTOX® Cosmetic. Injections can range from several hundred to several thousand dollars, depending on the number of areas that are injected. To maintain the effect, injections need to be repeated, at additional cost. Botox parties have been a staple of many women?s social calendars for the last few years, the hope is that the specialist giving you your treatments is qualified and behaves in an ethical manner. Patients may have to pay with their health or even their lives if they mistakenly choose an unqualified, unscrupulous practitioner to administer wrinkle-fighting injectable treatments. It has been reported, although not frequently, that several cases have emerged of what has become an increasingly common problem -- illegal and unsafe drugs administered as cosmetic treatments by practitioners without appropriate training or credentials. In some cases there have been reports suggesting the individuals who have gone through these botched procedures might be suffering from botulism, but it turns out to be the result of something else. Cases such as one reported in Fort Lauderdale, FL, have suggested that the individuals may have been injected with an unapproved substance, perhaps containing botulinum toxin or some other agent. There is more than 15 years of clinical research and experience with the therapeutic applications of botulinum toxin (type A) on millions of patients worldwide, and it has never produced a response of botulism when it has been used at recommended doses. Botulism is very rare. According to several infectious diseases experts, the disease is contracted only by eating or being injected with living spores from the botulinum bacteria. This may occur by eating unpasteurized food or through a contaminated, open wound. With the popularity of injectables, including Botox and other soft tissue fillers- it may have encouraged non-medical practitioners to obtain illegal substances and perform procedures under unsupervised conditions. Incidents reported have been documented where patients were seriously harmed by injections of non-medical grade materials. Patients are lured in with the promise of cheaper treatments, or with promises of "new, breakthrough" procedures. The fact is that treatments such as skin resurfacing and Botox injections are medical procedures that need appropriate training and qualified judgment in order to ensure safety. Procedures should be performed in appropriate facilities by a properly qualified physician who has received the specific training in the particular procedure. Botox temporarily blocks the impulses from the nerve cells to the muscles that cause frown lines and other dynamic wrinkles, smoothing out existing lines over time, preventing further development of wrinkles. Botox treatments may require repeated treatments to maintain the results. According to statistics nearly 2.8 million Botox procedures were performed in 2005, making it the United States most popular non-surgical procedure.